We’ve all been watching the demolition and it’s finally time for the official ground breaking. Today, at 11am, Mayor Muriel E. Bowser will join Anthony Lanier, president of Eastbanc, and other city officials and neighborhood leaders for remarks and a ceremonial groundbreaking. According to the initial timeline released in February, excavation will start soon and continue into the fall, followed by vertical construction, and then facade and interior construction. Visit the project website, hineschool.com, for updates, news, and contact information. 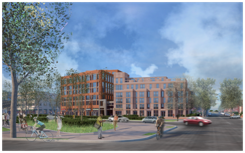 Washington, DC – On Friday July 17, Eastbanc Inc. and Stanton Development will begin construction on the anticipated Hine School Redevelopment Project at 700 Pennsylvania Avenue, SE during a ceremonial ground breaking event. The official ceremony is open to the public and hosted by DC Mayor Muriel E. Bowser and other city officials and community leaders. The event is scheduled to begin at 11:00 a.m. with introductions by Anthony Lanier, president of Eastbanc, Mayor Muriel E. Bowser and will conclude with a groundbreaking photo opportunity at 11:50 a.m. Designed by architects Weinstein Studio, Esocoff & Associates and landscape architect Oehme, van Sweden & Associates, the Eastbanc/Stanton Hine School redevelopment project will transform the grounds of the former middle school at Eastern Market to a new mixed-use development including an 163,000-square-foot office building, 162 apartment residences that include 46 units of affordable housing and 116 market-rate residential units. Plans call for 60,000 square feet of specialty shops, boutiques and restaurants with an emphasis of locally-owned retail and include 1,000 square feet of incubator space rented at 75 percent of market rate; a permanent home for the popular Eastern Market Flea Market on weekends that features a stone-paved, tree-lined newly opened C Street (connecting 7th and 8th Streets) that realizes the L’Enfant Plan; 327 parking spaces for residents, office workers, shoppers and Flea Market vehicles and a landscaped plaza. The Hine Redevelopment Project’s commitment to sustainability includes Gold and Silver LEED Certified designs, green roofs, car-sharing and underground bike racks and showers. The Hine School Redevelopment project is the result of collaborative effort and strategic planning from the District of Columbia, EastBanc, Stanton Development, Dantes Partners, LS Caldwell & Associates, Clark Enterprises, Jamestown LP and The Warrenton Group. The project has received support from the Coalition for Smarter Growth, Capitol Hill Restoration Society, and Advisory Neighborhood Commission 6B.